"Fan blade failure due to cracking, if not addressed, could result in an engine in-flight shutdown (IFSD), uncontained release of debris, damage to the engine, damage to the airplane and possible airplane decompression," the regulatory authority said. In line with recommendations made earlier by engine maker CFM, the FAA ordered that all CFM56-7B engines that have performed 30,000 or more total accumulated flight cycles be inspected within 20 days. That affects about 352 engines in the United States, or 681 worldwide. Each inspection of the engines, which power Boeing 737 aircraft, takes about four hours, according to CFM International, a joint venture between America's GE Aviation and France's Safran Aircraft Engines. Once the inspections are completed, CFM recommended to repeat the process every 3,000 cycles—about two years in airline service—but the FAA did not require such a measure. CFM also recommended that fan blades with more than 20,000 cycles be inspected by the end of August—affecting an additional 2,500 engines. Around 60 airlines use the CFM56-7B, according to the company, which said GE and Safran have mobilized about 500 technicians "to support customers and minimize operational disruptions" related to the inspections. The directive comes after the left engine of Southwest Airlines Flight 1380 suddenly blew apart during a Tuesday flight from New York to Dallas. Fellow passengers pulled the passenger—identified as Jennifer Riordan, 43—back in, but she later died of her injuries. The plane made an emergency landing in Philadelphia. A first inspection of the Boeing 737's damaged engine showed that an engine fan blade was missing, apparently broken due to metal fatigue, according to the National Transportation Safety Board. 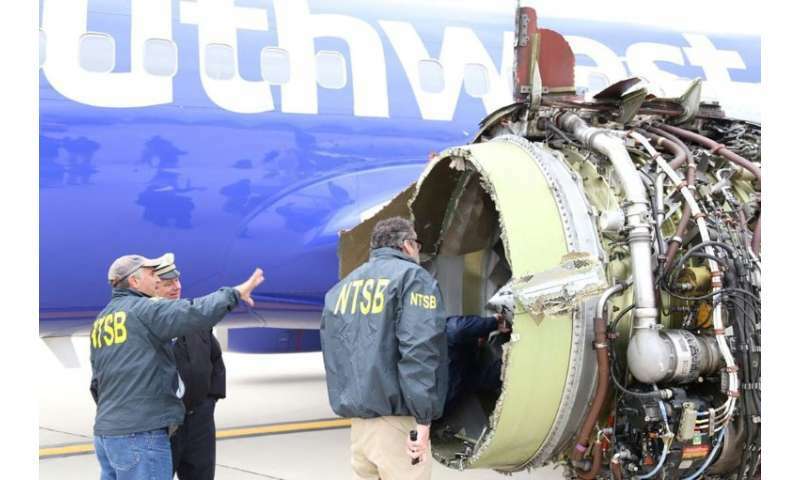 Southwest announced just hours after the incident that it would conduct additional inspections of its CFM56-7B engines. A similar accident on a separate Southwest flight in August 2016 had forced the plane, equipped with the same engine, to make an emergency landing. There were no victims. CFM and the FAA both called for inspections of the engines at the time, but the regulators did not publish a directive.